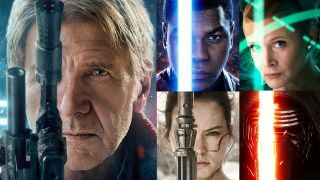 Adding to the hype machine before the film's release next month, new Star Wars: The Force Awakens posters have landed, giving us a closer look at five of the main cast. While we've already seen quite a bit of John Boyega's Finn, the new posters give us a closer look at Kylo Ren, along with a better look at Leia and Han Solo, as well as scavenger Rey, played by Daisy Ridley. Of course, there are a lot more characters in the new film, old and new, and we still haven't had a look at Luke Skywalker yet, but the release of these five do seem to indicate we'll be following Han Solo, Rey, Finn and Kylo Ren pretty closely in the film. Still, there's more than a month left until the film's release on December 18 (December 17 for UK and Australia), so expect to see more character posters, trailers, merchandise and clips added to the hype machine in the coming weeks. Meanwhile, you can check out all five posters on the Star Wars website.